There aren’t many musicians whose live records are prized more highly than their studio ones. Texas folk/country legend Townes Van Zandt happens to be one of the few. 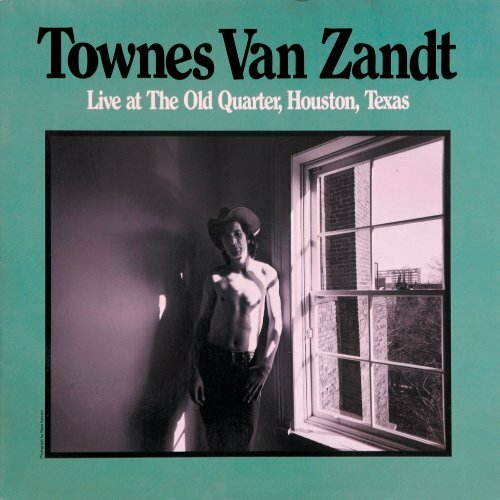 While van Zandt’s studio albums are often maligned for their attempt to jam the square peg of the songwriter’s gritty, barebones blues into a round “pop country” hole, the live recordings present Townes at his most brilliant: simply strumming on a guitar and singing his heart out. And while several such recordings exist, it would be difficult to suggest that any other album than Live at the Old Quarter, Houston, Texas deserves top honors. Not only does Old Quarter contain some of Van Zandt’s best work, it was also recorded in 1973 before drugs and alcohol had begun to take a serious toll on the artist’s health and performances (not that he wasn’t doing them at the time). Van Zandt’s (arguably) most famous tunes “Pancho and Lefty,” and “Waitin’ Around To Die,” both make notable (and perhaps their best recorded) appearances, as do covers by Lightning Hopkins, Doc Watson, Merle Travis and Bo Diddley (a testament to just how much the blues played a part in the singer’s formative years). To listen to ‘Brand New Companion,” as well could even lead you to believe that Van Zandt was more blues than country. It is also possible to identify the artist’s folk influences, particularly Bob Dylan, in tunes like “To Live Is To Fly,” “She Came and She Touched Me,” and particularly the two “talking blues” tracks, of which “Talking Fraternity Blues” is reminiscent of Dylan’s 1964 “Talkin’ John Birch Paranoid Blues” in its cadence and anti-establishment humor. In addition “White Freight Liner Blues,” ‘Kathleen,” “No Place To Fall” and “Only Him Or Me,” are all notable for their demonstration of Van Zandt’s specialty: melancholy tear jerkers. Noone has ever really done sadness better than Townes Van Zandt. Perhaps he gained some special insight from his lifelong depression, substance abuse, or simply his own tragic story (the artist lost all his childhood memories after shock treatment) because it’s impossible to hear Van Zandt sing about the lonely blues without feeling some of that loneliness yourself. When he opens his mouth to sing his pain becomes a shared burden with anyone listening. Though tragically despite a lifetime spent sharing such burdens in song onstage, it was apparently never enough to ease the songwriter’s suffering. In 1997 after spending most of his life doused in alcohol and drugs, Van Zandt life came to an abrupt end due to heart failure. And while Townes Van Zandt may have been lost, like too many others, before his time, his (still underrated) legacy remains in the body of his recorded work. And while he recorded some good studio material in a thirty year career, Van Zandt’s most accessible work remains his live recordings. I would heartily recommend pretty much any of his live stuff, but the best place to start is at the top, and to my mind there isn’t anything better than Live At the Old Quarter.